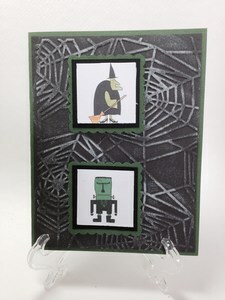 With this card I used an older Halloween set from Stampin Up. I love the witch and Franky, what can I say. I used a spider web embossing folder on black cardstock for the background and then used white chalk ink on top of the web to give it some high lights. I added another little monster on the inside with a trick or treat sentiment.